The enantioselective preparation of three protected β-amino- γ -hydroxyesters from benzoic acid is described. The employed synthetic methodology involves the ipso, ortho cis-dihydroxylation of benzoic acid by the mutant strain Ralstonia eutropha B9, followed by a selective halonium induced beta lactamization. Modification of this novel β-lactam structure by the appropriate sequence of reactions allows for the selective preparation of the aforementioned β -amino- γ -hydroxyesters in a diastereodivergent manner. The overall transformation results in a selective formal aminohydroxylation of the diene moiety of the initial cis-cyclohexadienediol. The synthesized products are important building blocks and will allow for the selective preparation of aminoacids, inosamines and alkaloids from benzoic acid. 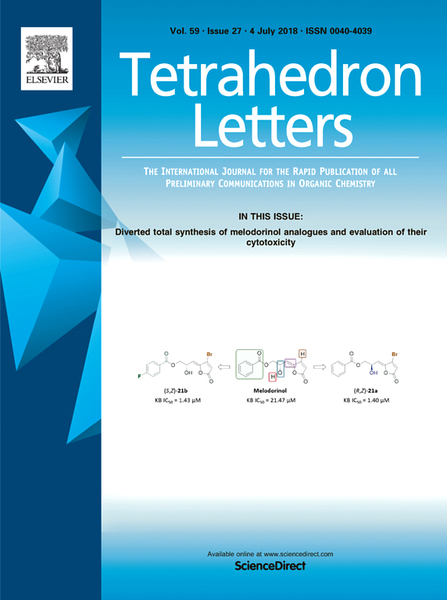 Pazos, Mariana, “Production of enantiopure b-amino-c-hydroxyesters from benzoic acid by a selective formal aminohydroxylation,” RIQUIM - Repositorio Institucional de la Facultad de Química - UdelaR, accessed April 20, 2019, http://riquim.fq.edu.uy/items/show/4972.